Watch for new and upcoming articles by Mary Martin Weyand when viewing new issues of Homeschool Magazine.com. Happy Reading! 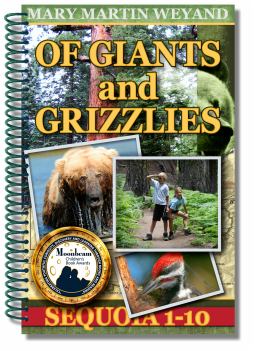 Of Giants and Grizzlies - A Big Hit in the Classroom! Too bad that you can’t see the amazed faces that I see when presenting Of Giants and Grizzlies in the classroom or assembly room. Middle Grade students enjoy hearing and seeing for themselves the fun facts and surprising stories of Sequoia National Park, then and now! California grade schools, both public and private, are booking our California history/science program for this school season and next.